The man stood at the edge of the bridge, looking at the water far below. The traffic that passed ignored him - he was just another homeless person - invisible to most. Besides, people were celebrating Christmas, and the suffering of someone on the bridge was of little concern. Richard LeMieux had lost everything during the past year. His business and home, his country club membership and his sailboats were gone. With his fall from financial success, his support system crumbled. He was an embarrassment to his family, and his ‘friends’ had long stopped returning his calls. High atop that long cold bridge, Richard felt like a failure yet again. He desperately wanted to end his life, but he couldn’t even do that. For, in his van waited a small white dog named Willow, and he could not abandon her. So, Richard returned to his new life of surviving on the streets. It has been eight years since he stood on that bridge. Years of pain, hardship, growth and miracles. “I was a 58 year old man with no place to go and no one could fix my problems for me,” said Richard. But, a few people did care, and slowly, the mending and the growth began. “I got little bits of hope from a lot of people and I had to write about what I saw,” he said. So he wrote. He wrote about those who fed him at the Salvation Army, and the people at Kitsap Mental Health who listened and cared. He wrote about the odd assortment of friends he began making who were living on the streets. About kids living together in the woods and a mother raising her family in a storage unit. He wrote about the dark times, and the unceasing love of his dog, who got him through so many cold and lonely nights. Without meaning to, Richard had a book - deeply personal and meaningful. With the publication of “Breakfast At Sally’s” many have come to better understand the plight of the homeless, and three shelters have opened around the country, named after his little dog, Willow. I was honored to meet with Richard last month, and I felt his story deeply. There was no sense of bitterness over what he had endured, and no arrogance over his accomplishments. The man I sat across from was warm, gracious and humbled by the events of the past few years. Richard no longer sleeps in his car, but he is still a regular at the Salvation Army where he has become a beacon of hope to others. “Now, I live to make a difference. For myself, I only want a place where I can be warm and dry and where I can write.” Richard is working on a children’s book, “Willow The Wonder Dog”, about how dogs give us unconditional love. With so much to discuss, Richard and I talked for hours. As we prepared to leave our little coffee shop a man approached. Richard took his hand, looked deeply in his face and told the man how proud he was of his accomplishments and of the efforts he was making in his life. I had the sense that this was a man who was overcoming his own life challenges, and I could tell that Richard genuinely cared. He knew and practiced the truth - that each individual has the ability to be the voice of hope in another person’s life. May the holidays not bring you bags of goodies, but peace, hope and an appreciation of each other and of each day’s miracles. 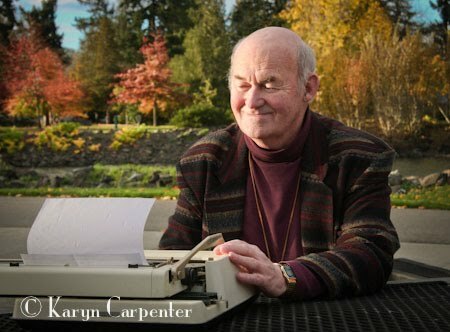 Photo: Richard LeMieux could be found writing his book, "Breakfast At Sally's", on a donated manual typewriter at local parks. Please click here - take a moment and order a copy of this amazing book, "Breakfast At Sally's"! So many truths in your blog. It brought tears to my eyes. Thank you so much, Holly. It was wonderful meeting you and having you join us for the Hughes/Carpenter family Christmas gathering. I'll be in the area for a few more weeks so will watch for you when on Morgan! Sad yet inspiring. In this economy I can see similar scenarios played out all across this country and others, most with a less desireable result. Willow could be a furry angel. What a wonderful story that not only is Richard doing so much better but that he appreciates what he now has and uses it and his story to help others.